Student loans are a lifeline for college students without the means to foot the full bill for higher education. But the hardships begin when they graduate. For the Class of 2016, the average student loan borrower has more than $37,000 in student debt. Juggling student loan payments with other bills can sometimes seem impossible if you're making a low salary. Luckily, you do have options that can make your student loan payments easier to bear. Here's what you can do. There are two broad types of student loans: federal and private. Federal student loans are the easiest to deal with. That's because there are a number of programs designed to make your monthly payments more affordable. Private student loans are much less flexible because it's up to the individual lender to decide whether they want to help you or not. But as we'll see below, you still have options if you've got private student loans. These programs all require some hassle to set up and maintain with your loan servicer. Once in place, however, your monthly student loan payments can be lowered to 10-20 percent of your discretionary income for 20-25 years, after which they are forgiven. The difference is in how you qualify for them and the particular details of the program. Some programs have certain income requirements and loan type requirements (yep, they are limited to even certain types of federal loans). Each program works slightly differently as well, in terms of how much you have to pay and for how long. It sounds like a confusing web to navigate, and it is. 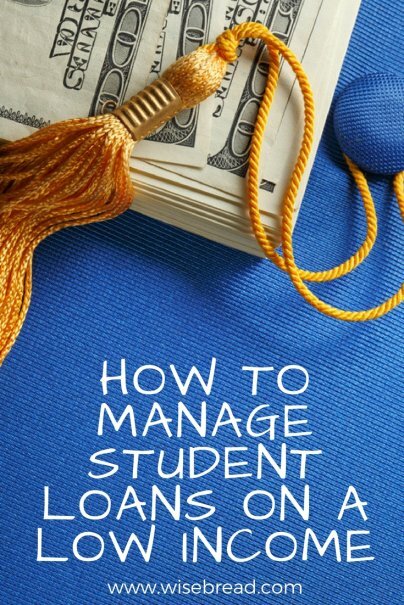 But if you need your monthly student loan payment lowered for the long term and take the time to research the right federal student loan repayment program for you, it can make a world of difference for your financial health. One important note: Refinancing is often touted as a cure-all for high student loan payments. While it can be beneficial in certain cases, you should think long and hard before you do this with federal loans. Refinancing the loans with private lenders (a different thing than consolidating all of your federal loans into one loan) means that you might get a lower payment, but you lose all the nice federal protections outlined above. If you're facing a temporary financial crisis such as a job loss, injury, or other economic hardship, it might make sense to ask for a temporary forbearance or deferment. The programs can offer you up to a three-year break from making student loan payments. Unfortunately, private student loans are a bit like the Wild West. There are no federal rules requiring private lenders to work with you on a repayment plan. They're completely within their legal rights to continue charging you payments you can't afford, even if it puts you in financial jeopardy. Still, it doesn't hurt to call up your private student loan servicer to ask them for a break. "If you're having a hard time making private loan payments, you can try reaching out and seeing if they'd agree to a modified payment schedule or forbearance, but the answer will probably be no," says Travis Hornsby, founder of Student Loan Planner, a financial coaching and consulting firm. After that, another option is to try to refinance your student loans with a different private lender for a lower rate. Keep in mind that many lenders require a minimum loan amount of $5,000 to refinance. You'll also need to prove that your income is high enough that you can make your new monthly payments, even though they're smaller than your current ones. In addition, you'll need a good credit score to qualify for interest rates that are low enough to make a refinance worthwhile. A FICO score below 640 is likely to disqualify you for a refinance. If you are granted student loan forbearance or deferment, use your time wisely. Plan on how to get your financial ship righted so that you are able to afford the monthly payments when they start back up. Refinancing can help lower your payments, but don't let that lull you into complacency. You should still make every effort you can to pay off the debt as soon as possible. Defaulting on student loans can do serious damage to your credit. Finally, if you sign up for an income-driven federal student loan repayment plan, make sure you know what the requirements are and that you follow them to a T. One filing slip-up can result in you being ineligible for the program. And if you expect a portion of your student loans to be forgiven at the end of the repayment term, remember this: The forgiven amount is considered taxable income by the IRS, meaning that you need to be saving for that bill, which could be considerable. Student loans are no fun to deal with. But you can get over them even if you have a low income by using the programs outlined above. It won't be easy, and it might not be quick, but thousands of people have done it before, and you can do it, too.